We won't offer "our" solutions the minute we see you. We want to know your needs as you feel them. Then, and not before, we will propose our unique value proposal. We wanted the structure of our Web site as simple as possible. We have articulated it in four parts. In "The Firm" we introduce us; say where we go to and establish our commitment to perform the highest quality service. in "Capabilities" we expose what are we able to do in order to help you succeed in managing your organization in key areas, alone or accompanied with other strategic allies. Our Capabilities are described with more detail for you to judge whether we are ready to help. In "Consultancy" we expose the different types of services we can offer to help you and the ways of using our services. You choose the capabilities you want to deploy from us, the type of service you need, the most suitable time horizon and the type of contract according to the information available until that time about the object definition. In"Resources"and "Blog" we use our insights as a letter of presentation to add evidence about our knowledge to help make your choice. Our Capabilities ... and yours, if you want. 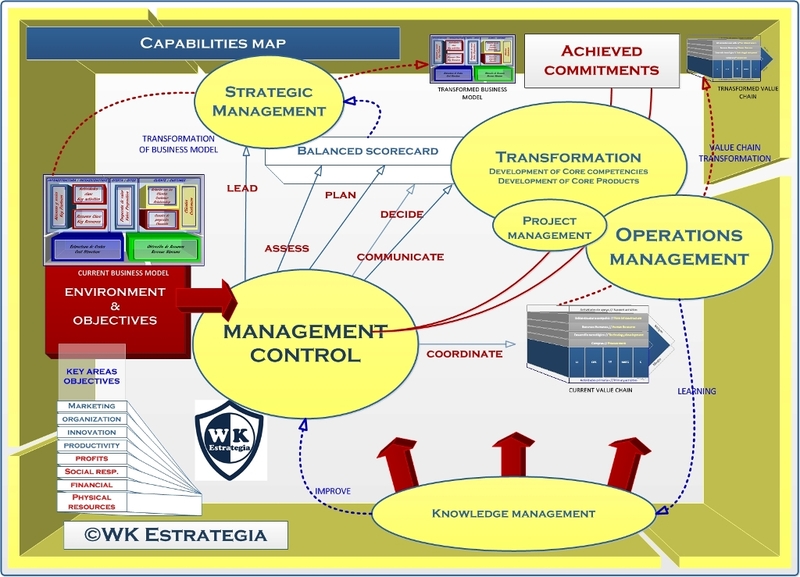 The following map shows our capabilities within the general framework of managing an organization. All capabilities are intertwined each other and that of Management Control allows to direct them towards the vision of the organization. In WK Strategy, we know that what we propose is good and we offer it. To adapt to the changing environment and to seize its emerging opportunities, or circumvent the threats, the business model must evolve along with the organization's activities of the Porter’s value chain. Transaction costs will change, so existing capabilities must be improved, and signals from new ones must be identified to avoid mistaken outsourcing decisions because managers were blind to identify those signals. The strategic management capability develops the strategic architecture and identifies each of the key areas of business objectives, to evolve from the current business model to one that best fits with the strategic environment. Management control starts from the strategic formulation to implement it effectively. The general and specific environment and objectives in key areas determine the framework and input respectively. Knowledge management arising internally from operations, project management or experimentation; and externally from best practices or as a result of competitive surveillance systems will provide new things to learn and consequently will bring business improvement over competitors. It's necessary to move on; not to rest on just achieved goals. All this is about transformation of the business model and updating the value chain based on developing Core Competencies and Core Products. IF INTERESTED IN MASTERING KEY AREAS OF THE ORGANIZATION. Excellence in operations is becoming a key issue to stay ahead of competitors. Small differences mark the success or failure of an organization. To eliminate inefficiencies, ensuring maximum efficiency with existing resources. To overcome technological barriers to redesign operations in order to improve the overall organization’s performance beyond the known. Want to know the three questions you should solve before becoming a learning organization? Want to know how to continually improve your organization? Want to get that your organization become a learning organization? Want to know the five activities your organization should master, to become an effective learning organization? Need help to train your future managers to solve many of management problems and the organization’s strategic issues? If you want to start your entrepreneurship. If you want that your organization perform its activities properly. If you want to design, implement and manage the strategic process as the best. Want to tender properly and be prepared to fulfill the obligations set out in the contract. Are you interested in knowing the entire tendering process? Want to know the evaluation process, the general criteria and how to prepare your offer? Want to know how to share objectives with other partners and leverage the alliance in the best way in tendering process? Once you’ve been awarded, want to fulfill the obligations set out in the contract excellently? Are you innovative and wants to know what Innovative Public Purchase is? Want To design, implement, develop and control its overall strategy in a transparent and rigorous respect for the law and citizen’s interests? To develop the core competencies and core products using institution’s resources the best way and in the right direction? To effectively communicate and implement the overall strategy? To face with updating your strategy? IF YOU MANAGE A NON PROFIT INSTITUTION. To know what to do to improve its management?